Comfort is the number one thing that comes to mind for most reviewers of the Vans SK8-Hi 46 MTE DX. One of them said extended wear of this high-top sneaker does not put any strain on the feet whatsoever. High-top Vans footwear like the Vans SK8-Hi 46 MTE DX has an appealing style that’s also quite slimming on the feet, many users said. They also added that the shoe looks exactly as beautiful in person as it does in the photos. According to a good number of testers, the casual sneaker feels warm and completely waterproof. They also liked how the material used is not too thick yet gives enough warmth for even very cold weather. Several people were happy with the great fit width-wise of the Vans SK8-Hi 46 MTE DX. The quality of the lifestyle shoe is excellent and this can be seen in the materials used, some individuals commented. A handful of purchasers remarked that the colors available for this high-top sneaker are superb and look beautiful on the feet. They also recounted receiving plenty of compliments on their choice of kick. The Vans SK8-Hi 46 MTE DX provides great traction on snow and ice, a few buyers reported. The Vans SK8-Hi 46 MTE DX runs slightly larger than standard sizing according to a number of reviewers. One person complained about his shoe showing lots of signs of wear after only a few times of use. Cold weather is no hindrance to looking stylish with the Vans SK8-Hi 46 MTE DX. This high-top sneaker from one of the biggest skating brands worldwide will get you through even the fiercest cold with its warm fleece lining and heat-retentive layer. Even with its warm build, the sneaker is not bulky and, in fact, has a slimming effect on the feet. The colors are equally attractive, and the inverse waffle sole will ensure you get to strut this shoe without worrying about the slippery ground. The Vans SK8-Hi 46 MTE DX descends from a timeless classic with lots of history behind it. In the late 70s, a ground-breaking design called the “Style Number 38” was released by the brand. This model took the skating world by storm due to its new above-the-ankle cut. The new profile achieved much success due to its efficiency in shielding ankle bones from falling skateboards and also because of its “cool” style. Style Number 38, later renamed as the SK8-Hi, went on to become one of the most iconic silhouettes in the Vans lineup. It has been reissued and remade many times over. In 2014, the brand came out with yet another edition of this sneaker designed to withstand all kinds of weather. This version became known as the SK8-Hi MTE or Mountain Edition. The SK8-Hi MTE updated the original silhouette from the ground up, changing the waffle outsole into an inverse lugged one and lining the upper with a fleece material for warmth. A gusseted tongue was added along with a Scotchguard-treated exterior to repel liquid. For the SK8-Hi 46 MTE DX (Mountain Edition Deluxe), Vans took the MTE and updated it even further with a deluxe weather-resistant canvas and suede upper. An UltraCush insole was also added to the mix for long-lasting comfort. Bring out your adventurous side with this high-top shoe. Going out in chill weather should prove no trouble at all when you are wearing the Vans Sk8-Hi 46 MTE DX. Wear this sneaker with skinny jeans, your favorite tee, and a slim-cut puffer jacket. The Vans SK8-Hi 46 MTE DX is too cool to be confined to just one gender. This unisex sneaker is available in sizes ranging from 3.5 to 11.5, perfect for people, especially women, who have smaller feet sizes. The high-cut profile of the shoe gives maximum ankle support as well as adequate protection from shocks brought about by skating. Lace-up closures provide a secure way to customize the shoe to the foot. The Vans SK8-Hi 46 MTE DX is a revamping of an already legendary shoe with more practical and functional elements. The vulcanized lug outsole, which is an inverse of Vans’ signature waffle pattern, gives the sneaker maximum traction on slippery surfaces. The premium Scotchguard-treated upper keeps moisture out while the fleece lining and heat-retention layer keeps the foot cozy and dry. 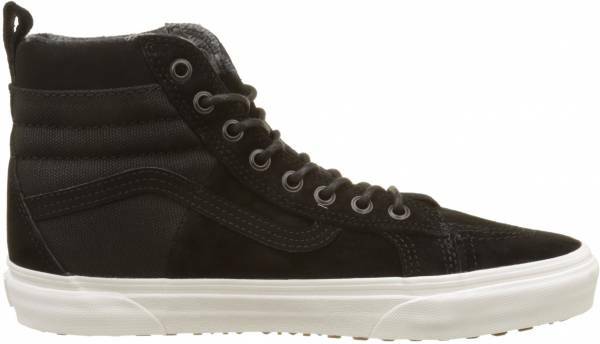 The Vans SK8-Hi 46 MTE DX features a padded collar, reinforced toecap, and suede and textile upper.